In fact, it seems like we have numerous reasons to choose the proper equipment for an indoor commercial playground or an outdoor playground. In those rural areas, we may difficult to offer children meaningful and healthy fitness, as well as social opportunities. According to theories of developmental psychologists, indoor playground equipment will help develop child’s skills, as well as help them grow healthily. Even more, children can learn about fair play and proper manners while playing with others. As a matter of fact, it is in Germany where people created the first playground to keep kids away from busy streets. At that time, children would play in certain places above piles of sand with the supervision of police forces. In 1885, a German Dr. Marie E. Zakrzewska brought the idea of creating a playground to Boston, United States. A few years later, the idea becomes popular in New York City and schools began to build the sand playground in their places. In 1906, President Theodore Roosevelt offered his strong support for creating the Playground Association of America. Over the past decades, one of the biggest innovations happened to playground and family entertainment. That refers to the birth of an indoor playground and application of indoor playground equipment. Since that time, producing soft play equipment for kids become a trend in children’s entertainment centers. In fact, because Jack Pentes invented the soft indoor play equipment in 1982, indoor children’s entertainment centers then turned into an explosion. Soft playground equipment was intended to prevent injuries while playing. Soft playground equipment was invented to protect children from hurting themselves or falling down. Since its birth, soft playground equipment becomes more and more compact. It can be reorganized and designed in multilayers. Thus, it has enough flexibility for most of the indoor areas. Alternatively, indoor playground equipment enables children to play in those harsh days and all seasons. Generally, we will take many factors into our consideration when we are going to buy indoor playground equipment. For example, the design, layout, safety standards, age-range of the child, maintenance, and so on. We have made a comprehensive analysis for purchasing the indoor playground equipment. Based on related regulations, every child will need at least 2.5 square meters in an indoor playground. Also, fitting, washrooms, storage spaces, fixed equipment, toilet, and sleep areas for toddlers, will all consist part of your indoor playground. Still, you have to leave some space, which is not for play, to perform other activities. Besides these, you should plan a space for an adult to accompany their children or work at the facility. Next, you will need a space to meet with staffs or parents. Finally, you shall not ignore the space for program planning and for storing attaching educational materials. In our indoor playground, we always have to leave the toddlers with a special area, as well as some special play equipment. Actually, the most important reason is that the toddlers need toddler indoor playground equipment to stay away from those older kids. Usually, compared to older children, toddlers are still in a primary stage to find their balance. Considering that the toddlers are not steady enough, it is a good choice to provide them soft indoor play equipment to have fun. In order to confirm the final size of your play space, you should also take some time to look through the following questions. Also, these questions aim to help you make the ultimate decision about buying indoor playground equipment. Looking into examples above, and think about: What are the main purposes of your indoor playground? How many visitors you will probably have? How many kids will use the equipment you are to purchase? What size will your place be? How many competitors you may have in your sectors? Where you can set up your superiority? How much are competitors charging? How much budget you may need for rental or buying the space? Before you decided to purchase your indoor playground equipment, we have some real examples for you. These examples are going to tell you the exact equipment type suits for different places. The hospitality sectors: As international travel becomes more and more popular, domestic hotels continue to increase their value by hosting family-friendly activities for a child of all ages. The indoor playground there provides comfortable supervision areas for parents. Also, a variety of activities provided in a safe and fun environment successfully bring the vacationers closer to each other. Hosting birthday parties for children to have some recreational experiences became a trend in America. In the meantime, restaurants loved by children combined the all-inclusive way to the dining establishments to be more attractive. In this way, restaurants and such kind of businesses will need high quality and reliable commercial indoor playground equipment for frequent usage. Centers in the community: Many communities and municipalities build centrally located amenities and facilities, which enables them to install commercial indoor play structures throughout the whole year. In this way, they can take advantage of the extreme climate and allow enough supervision. Health care industries: As we all know, commercial playground equipment can bring children physical and mental benefits. Thus, therapy centers and hospital like to employ indoor playgrounds to help with treatment. With the special play equipment, young kids will rebound from injuries or surgeries soon. Also, those employees’ child will have good care in such a daycare playground. According to studies, the sick or injured child can reduce recovery times through the play. While they are playing and interacting with other kids in the indoor playground, they would feel very happy. Many prospective playground owners will think about: How many kinds of indoor playground equipment I can choose from? How to choose the proper indoor playground equipment suits well for mine? Sure, we will take these into our consideration if we are going to purchase some equipment. There is a well-known thing that children always love to play with various kinds of play equipment. For example, the colored slides, exhilarating swings, simple but fun seesaws, sweaty playhouses, and exciting trampolines. Children can find various kinds of experience in these different activities. For babies and younger toddlers, the soft play equipment such as tunnel &highway, movement, balance, and construction toys will be fun and helpful. Besides, those favorable ball pools cannot be ignored when it comes to soft play equipment. Generally, children can nor grow healthily without enough physical activities. Through those playing and games, kids can develop their functional skills. For instance, playing in an indoor playground allow children to work on movement and coordination skills. And active play will help them to improve their manual dexterities. Actually, living in an urban lifestyle, children have no chance to play outdoors like former days. Sometimes, even if we have a backyard or we live nearby a park, kids still cannot play in harsh days. During some special times, colder days, parents won’t allow their kids to play outside. So, the indoor playground will help cure this pain. Today, we have a variety of indoor playground equipment to choose from. For example, soft play equipment, sometimes called soft play shape or soft play blocks, will provide us a good choice. Soft play like Kids Ball Pit, Teeter Totter, Rock Climbing Wall, Soft Play Highway, could help solve our problem. Also, those simple and fun seesaws can be a good choice too. Children can have a lot of fun with a small seesaw, animal seesaw, and plastic seesaw. As a matter of fact, indoor playground equipment design should be flexible for the play space. Because of the custom design, you will not need a big room for some indoor equipment like rock climbing walls. Alternatively, commercial play equipment should have easy-to-follow instructions or guidelines. This is because the majority of your customers are small children, and they have limited comprehension for complex things. However, you have to recognize clearly that different equipment is for kids of different ages. Some of the equipment above are suitable for toddlers and babies, while others are designed for older kids. Overall, there is always many indoor playground equipment you can choose from. You can always find some play equipment to meet your requirements. Still, they will not bring you too much problem when it comes to installing or spacing. Indoor climbing walls are what we can see in the indoor playground to help children foster their coordination, climbing, and balance skills. Actually, it is a good choice for you to install such a climbing wall in your indoor playground. Because it can help you retain the child for your indoor play park. So, what does the climbing wall feature anyway? First, an artificial wall it is. Second, it has artificial rocks built into its surface. With those rocks, climbers can hold on steadily by their feet and hands. When it comes to installation, if you have enough sporty activity and physical health, you can install it easily. Most of the time, you can install the wall without any harms or hurts on it. Actually, there are a variety of climbing structures designed for children. For example, some of these climbing structures feature climbing wall, while others are in shape of rock climbing wall. Still, you can find the baby rock climbing wall, which aims to help the growth for children in their early developmental period. Besides these climbing walls, there are still many types of climbing structures. For instance, step 2 game time sports climber, square climber climbing cube, Lil monkey playground jungle gym set, toy monster jungle monkey bars tower, step 2 panda climber, little tikes tunnel dome climber, treetop climb slide (a product combined slide with climbing), children factory soft tunnel climber (because of the soft material and low height, this climbing enables young children to play safely). Let’s have a further analysis of the reason why children will like rock climbing and climbing wall. And why you should have such kind of climbing wall in your indoor park. In fact, rock climbing installed indoor or outdoor will need endurance and physical strength. Sometimes, many people thought they may need more strength in their upper body while climbing. However, this is not completely correct. Your whole body will work when you are climbing. Also, lean muscle mass, lower body strength, and footwork will help you climb. Normally, many people think that rock climbing doesn’t belong to a type of cardio. However, rock climbing will pop your blood and make heart bump faster, just like you are jogging. According to related research, if you carry on an hour of rock climbing, you can burn out approximately 700 calories. Except for these, kids can improve their flexibility when they try to get a grip out of their reach. In fact, the benefits you can get from rock climbing seems endless. When you have added a rock climbing to your indoor equipment list, you will be able to help children improve their problem-solving skills. Sometimes, many people think climbing a rock climbing wall will bring them less mental benefits. Actually, climbing can bring many mental benefits and we just ignored it. For example, Baby rock climbing can help develop body awareness, as well as ameliorate problem-solving skills. If you want to climb fast and steadily up to the top of the wall, you have to put in a great deal of focus. With many twists and turns spreading on the surface of the climbing wall, you have to decide which bulge to grab, as well as which bulge to let go. Also, before shifting your body and weight, you have to choose a safe space to place your whole body. As a matter of fact, all children have the talent for climbing. Now, they have many places to show off this natural skill. For instance, an indoor climbing wall, outdoor climbing wall, or a Baby rock climbing wall, all are ideal places for them. Usually, they can find such a climbing wall in an indoor or outdoor playground or a public park. Actually, the reason why children like climbing are the same as that why a nightingale always sings or a flower bloom. They all have this kind of natural or inside need in their lives. Through climbing, children are able to see, touch, and taste new things in their tiny world. Also, they can discover their physical and mental abilities through climbing. However, when it comes to climbing, parents tend to worry about the safety of their child. Fortunately, there are many solutions for those parents. For example, baby rock climbing wall, soft play equipment, or an indoor house playground will truly guarantee the safety of kids. In general, whether kids play in a park, at school grounds or just at home, there is always the possibility of an accident. Sometimes, kids can always get hurt because of their careless action. However, less accident will be seen in an indoor house playground. With a climbing wall in an indoor playground, parents can have a modified and controlled environment for their child. Also, children can play with special children indoor playground equipment safely. They can keep themselves away from the obstacles and hazards of playing, while they are enjoying soft play equipment. Above are so much indoor climbing types presented with their special benefits. You can choose those proper ones for your indoor play park. With the help of right climbing equipment, you can always bring kids lots of physical and mental benefits. And they will come back for that fun and safe equipment again, sometimes back with their friends. For most of the indoor playground, they can install indoor playground slides without any big troubles. An indoor slide can show in different shapes like flat, tubular, or half cylindrical. with such outer designing, children can slide down happily without any fear of falling. As for its material, slides can be made out of various kinds of material such as metal or plastic. However, no matter what material the slides are made out of, they always have a smooth surface. And they usually have wavy or straight bodies. Usually, children have to climb up a ladder or stair to reach the top of the slide and then slide down. However, a soft climbing wall or rock climbing wall usually take the place of the ladder or stairs. In this way, we can make better use of limited spaces in an indoor playground. Followings are some types of indoor slides. Wavy Slide: You can always find that it features a wavy shape. Children will go up and down when they are sliding down the slide. This go-up-and-down feeling will make children an unforgettable experience. Tube Slide: While you are sliding down the tube slide, you can find it may have some bumps or be curvy in somewhere. Spiral Slide: A spiral slide goes wrap around its central pole, and has a helix shape. Actually, these indoor slides have combined the excitement with the durable plastic material. Also, this kind of indoor slides have the true spiral helical elbows to give kids a smooth, fast and fun experience. They offer kids thrilling experiences with its tight turns and corners. Straight Slide: This slide is totally safe for younger kids because it has a completely flat body. Although it is flat, kids can still have a wonderful and safe sliding experience. Drop Slide: Sometimes, people call it death slide or free fall slide. This is because a drop slide stands in vertical or near vertical. Kids will have an exhilarating feeling while sliding sown such a drop slide. Except for those slides, there are also many subcategories of free-standing slides for you to choose from. The subcategories of free-standing slides can connect to more than one indoor house playground. This will add more fun to your indoor playground. As we have mentioned before, children are more likely to get hurt in an outdoor playground while sliding. They may catch on to injuries like bruises, breaking bones, bumps, and sprains. Sometimes these injuries will be more severe like a head injury or traumatic. However, if kids use the slide in an indoor playground, they can drastically reduce the chance of those harms. The slides made of metal or plastic will cause more accident when they are installed in outdoor playgrounds. In contrast, the same slide installed in an indoor playground will make all accidents disappear. Generally, indoor playground equipment like slide has the same impact on physical development as the baby rock climbing wall. While playing in an indoor playground, children can easily bend and stretch their muscles. Facing with the fun indoor play equipment, children are always vulnerable. Because they can get lots of things from playing. While playing with a variety of children indoor playground equipment, children will get active naturally. This is the most amazing part of the soft play, as well as the most different part compared to computer games. Because children tend to play computer games without any purposes in their home. While playing with children indoor playground equipment, children can release their imagination and their smile, as well as inspire their activities. According to researches, playing slide will help children to stimulate their vestibular. In other word, children can develop stimulation of ear canal through sliding. This kind of stimulation can help children to achieve better control of balance while they are enjoying indoor soft play equipment. Also, because of the fact that slide takes them all the way to the ground, sliding can also help children to manage a greater control of their torso. Actually, children need to have at least 60 minutes of play time every day. A commercial indoor playground with fun indoor play equipment has its benefits both for kids and parents. On the one hand, kids can acquire the needed play time in the indoor playground. And they can get lots of physical and mental benefits. On the other hand, parents can save time which they are going to taking care of their child. Because the field staff in the indoor house playground will help them look after their little child. With the saved time, parents can continue to finish their office work or just to have a little break. The child can always enjoy their playtime in the indoor playground. They can not only have a blast time but also can strengthen their physical and mental skills. Also, they will stay safe, especially when they are playing with soft play equipment. For example, kids ball pits, kids ball pools, kids balance equipment, climbing wall, tunnel balance, baby rock climbing wall or a variety of seesaws (small seesaw, indoor seesaw, animal seesaw, plastic seesaw, teeter-totter). All of these soft pay equipment will help attract children’s attention and bring them plenty of benefits. Generally, the simplest swing set was considered as a hanging seat. In Latin America and Oonjal, India, people used to call indoor wing set “hammock” in the former days. In fact, the main structure of an indoor swing set is a handing seat. But now, the indoor swing sets have many extra options like safety belts and other subsidiary options. For an indoor swing set, it can be suspended by ropes made of different materials or metal chains. Countering the shapes and functions, the swing can have a variety of types. For instance, tire swings, rope swings, hammock swings, canopy swings, porch swings, natural swing (made by live trees), tandem swings (can sustain two at a time), and etc. Now, we will put our main focus on indoor swings, especially baby swings for toddlers or younger kids. Usually, indoor swings or swings for babies or young toddlers will have a bucket shape. For example, most of the indoor swings have holes to allow children to push their feet through. In the case of older children, those swings will have a safety belt combined with a semi bucket shape. Actually, this special shape is employed in outdoor or indoor playground equipment design. In this way, little toddlers and babies will swing safely and can reap their special fun. There are still other beneficiary factor kids can get from swinging. For example, kids can develop their coordinate abilities. While children are trying to make the swing to move or go higher, they can develop the coordinate movement. Pay attention to toddlers and young kids when they are on the swing. Then, you can find that they keep on adjusting to figure out how to move rightly. Also, they will discover their coordination and combination to make their swing set move rightly, as well as higher. Surely, we cannot just teach the child how to coordinate their move through oral efforts. Because children will have to work through the swinging process to truly develop such a skill. In this way, we have to get them an indoor swing set to help them go through such a swinging process. Actually, children who have experienced actual swinging will learn to coordinate his or her move faster and better than the one who hasn’t. In fact, they can learn coordination much faster with their parents’ introduction. For example, while kids are swinging, the parents can stand in front of the swing in a proper distance. Then, the parents can ask their child to touch their hands with his or her feet while going back and forth. Except for those pediatric swings, there are still special indoor swing sets designed for special usage. For instance, some indoor wing sets are for medical reasons. Children can get a great therapy experience by using such a medical swing set. Children will recover for injuries or surgeries faster by swing because swinging can help improve their happiness, and this situation has a positive effect on the recovery. Considering this fact, many pediatric centers will employ indoor swing sets to help them with therapy. And they have received good feedback. Through this brief introduction, you have learned some swing types and some of the effects they have. If you want to purchase indoor swings for your indoor play area, the information above will give you a reference. Indoor trampolines usually have a piece of strong fabric on the top and a steel frame underneath as the support structure. Between the taut fabric and the steel frame, there are multiple springs to sustain the weight. Usually, many people thought the fabric used in the outdoor or outdoor trampoline provide the elastic characteristics. But the actual functioned stuff are those multiple springs. This is the most interesting part when people talk about indoor trampoline. In 1936, Larry Griswold and George Nissen invented the first modern trampoline together. It is saying that they got the inspiration when they see the entertainers use the tight net in a circus. After that, Larry Griswold and George Nissen invited the entertainers to join the gymnastics team of Lowa university. So, outdoor or indoor trampoline actually function as a professional user at the very beginning. After that, people also use indoor trampoline to help their training for combating. And this becomes a common phenomenon during world war II. As time goes by, people gradually utilize the trampoline to help them work out or have some fun. So, the trampoline actually doesn’t have the fun part at the beginning, it just expanded its usage afterward. Now, we can see many different types of trampoline in our daily lives. For example, the indoor trampolines and home trampolines, which mainly provide people with joy and fitness. Also, you may also see the special trampoline for professionals or athletes on the TV, these trampolines are much stronger than the entertained ones. Usually, trampolines have a variety of shapes and sizes such as rectangular, circular, or octagonal. These trampolines in different shapes and sizes can provide plenty of choice for your indoor play area. Alternatively, those indoor or outdoor trampolines, whose users are mainly children, will preferably utilize waterproof material in producing. On the one hand, because of the child’s weaker immune system compared to an adult, they need a hygienic environment. On the other hand, children can easily stain the trampoline and the waterproof material will help with that. As a matter of fact, just like other indoor plays, trampolines also have its side effects. Without precaution in place, children might get injured either. Then, how can we prevent those injuries probably caused by the trampoline? Till now, there are various solutions have been proven worked on helping prevent injuries while using a trampoline in an indoor house playground. For example, indoor trampolines installed at a low height will dramatically help mitigate the harm of falls. Also, installing safety nets around the trampoline will help ensure children’s safety while soaring in the air. To remove kids from the seat in front of the computer or the TV, those indoor plays can help with that. Indoor active activities can not only help children get some workouts but also can enhance both their former and new skills. As one of the indoor plays, the indoor trampoline can actually make those active activities accessible for kids. Playing on an indoor trampoline will bring kids hours of fun, as well as great beneficiary effects. In fact, children can also test their persistence while playing trampolines. Kids will get excited when they perform their movement on an indoor trampoline. They tend to keep performing the same move until they master it. Through this repeated movement, their persistence will have an explosion. Also, children can become more confident as they perform better and better in an indoor trampoline. Actually, through jumping on a trampoline, young children will have a wonderful cardiovascular exercise. Children tend to move more frequently on a trampoline. That process will help them promote their flexibilities and motor skills. For young children, they have to constantly adjust their postures to maintain a good balance. Then, they can have a good balance of torso in other indoor plays. If the kids don’t like those traditional types of sport, the indoor trampolines will help them to come back to a sporty lifestyle. Jumping up and down and flipping on the indoor trampoline will bring them needed exercise while inspiring their interests in physical activities. Though only a low-impact act is involved in using the indoor trampoline, children can still exercise their core muscles and burn out lots of calories. Normally, indoor trampoline brings great benefits for children with special needs. As educational scholars said, playing and jumping on the indoor trampoline can meet the special needs of children. For example, it is easy for children to jump up and down on a trampoline, while they can still get enough physical exercises. Also, children can strengthen their muscle strength during this process. Alternatively, some researchers claim that playing on an outdoor or indoor trampoline can help cure off autistics. If you want to get such a trampoline for kids in your playground, various types of trampoline will satisfy your needs. There are many different trampolines in different shapes and form for you to choose from, based on your budget and limited spaces. The indoor playhouse is one kind of indoor playground equipment that can provide kids lots of beneficial advantages. Exactly, indoor playhouses will help children to enhance their social skills, as well as help them be more active and healthier. Sometimes, children can have a role-playing game in an indoor playhouse. Through such a game, children can release their imagination and encourage their creativities. What’ more, neither should parents worry about what kids are up to, nor should they worry about where they stay. Because indoor playhouse can give the child a totally secure and safe environment for them to have fun. Sure, all parents hope that their children can play whenever they want to since child need a healthy dose of fun activities throughout their whole lives. However, in those pretty hot or big rainy days, children will not be able to gain enough healthy activities for themselves. Considering this, the indoor playground can help solve this question completely. Because there is always a friendly environment in the indoor playground and kids can play at any time. As one of the indoor play equipment, the indoor house can definitely allow children to play every single day and every season. Meanwhile, if parents take their children to play in an indoor house, they can save themselves plenty of time. In the former days, they have to take some time to take the child to a public park or somewhere outside. And that costs lots of time. Besides, not only kids will be less likely to get hurt, but also parents will save their money. Usually, stories linked to pirates, enchanted forests, princes, and princesses occupied the whole brain of a child. In an indoor playhouse, children can turn their fancies into reality. In fact, the indoor playhouse is considered as part of children’s lives by creating a small world for them. By playing in the indoor houses, children can increase their physical and mental power, as well as stimulate their creativities. No matter where they are, an outdoor or indoor playhouse, children can all extend their imagination, as well as build social skills. Actually, the main purpose of an indoor playhouse is helping kids to spend their day on healthy activities, like a role play in the indoor house. Compared to watching TV all day, those active activities like a pretend play will certainly help with children’s health. Sometimes, choosing an exact indoor playhouse type for your indoor playground seems a challenging task. So, we have given you some brief introductions above to help you form a primary acknowledge. As one kind of commercial play equipment, seesaw can have a variety of categories. For example, small seesaw, indoor seesaw, animal seesaw, plastic seesaw, and teeter totter. Sometimes, people call seesaw kids balance, which sounds more intuitive. Usually, the simplest form of seesaw consists of a narrow longboard which keeps its balance with a single pivot point. Usually, the indoor seesaw is much available while outdoor seesaw is much suitable. But their have the same benefits for children. Actually, the seesaw is considered as a playground staple in the past time. Its main structure is a board, which is evenly balanced on a pivot point. Two children can alternate soaring and cashing to the ground with a seesaw. While enjoying a seesaw with their friends, the child who does not hold the handrail firmly will fall down to the ground easily. In an indoor playground, which have the protective surfaces, children will be less likely to get hurt from falls, while over a concrete surface they will get hurt easily. Actually, playing seesaws in an indoor playground can create many beneficiary benefits for children. For example, children can significantly develop their balance and strength by playing seesaw. Also, the seesaw is a kind of extraordinarily collaborative play among all indoor plays. It can help children develop their collaborative abilities because a seesaw won’t work without the equal participation of two or multiple kids. As a traditional play in the indoor playground, the seesaw is what you may not leave behind when you are thinking about your indoor playground design. The seesaw can be installed without much man efforts. Still, it can attract children’s attention by providing them an unusual experience. Soft play equipment can easily be customized for your indoor play area. Also, you can change the quantity of soft play equipment based on how much your budget will be and how much soft play equipment is in use. For example, soft play blocks, soft play shape, ball pools, and kids ball pits all have the flexible capability to satisfy your needs. In fact, indoor house playground, as well as soft play equipment both have the characteristic of low maintenance. They will just take away fewer maintenances. So, you can put in most of your focus on maintaining other indoor play areas. BesidBesideslow maintenance, soft play equipment will provide a pretty secure environment for young kids or toddlers to have fun. Because of the “soft” characteristic, we can dramatically cut down the chance of harms to children. Nowadays, we can always find a wide variety of soft play equipment from those indoor playground equipment suppliers. For instance, tunnel and soft play hideaway, balance and movement, ball pools and so on. Tunnel and hideaway soft play equipment can always provide a fun and exhilarating environment for children. Actually, children extremely need such kind of indoor play in their early childhood years. A tunnel and hideaway soft play usually consist of a tiny ball pit, a short tunnel, and a small hiding room. Sometimes, children can sit in the pit spinning colored balls in their small hands. Playing those colorful and adorable balls will bring kids little fun. Also, kids can choose to crawl through the tunnel to hide in the hiding room. During this process, little kids will learn how to coordinate their hands with their feet. Besides, by exploring the tunnel and the hiding house, they will inspire their curiosity and release their imagination. Above all, children will get both mental and physical benefits from this soft play equipment. In many cases, soft play equipment aims to satisfy those special needs of a little child. Babies and little toddlers need special soft play equipment to play safely. On the one hand, soft equipment is more friendly than other indoor plays. That means children will play in a much safer environment. On the other hand, they won’t get hurt form the collision with older kids. Usually, soft play equipment is made of high-quality material, which also guarantees children’s safety. Sometimes, the soft play equipment can have a much higher safety standard. For example, they will employ the anti-bacterial technology to control the infection, especially for the heavily used equipment. Considering kids may lick or even swallow soft play balls, you should buy balls with phthalate-free, as well as nontoxic material. In this way, you can halt lasting damage or any long-term effects. Alternatively, you had better buy extra durable and tick indoor soft play equipment to sustain long-term usage. On the one hand, the durable soft play equipment can help you make sure the little child can play safely and healthily. On the other hand, high-quality equipment will help reduce your maintenance, from the long term. Normally, children can discover a better sense of torso balance when they play with basically soft play equipment and soft play tunnels. Also, going through such a playtime will help them develop their coordination and movement. In fact, children can take the soft play as a wonderful place to develop their motor skills, as well as keep themselves away from an isolated environment. Through playing in an indoor playground, children can deliver social interaction with each other, and learn those social skills. According to relevant studies, exploratory indoor plays or games can help children get more physical activities. In generally speaking, children can always find a wide variety of toys to have hours of fun in a soft play center. For instance, ball pools, crawl tubes, and rope bridges are all they can have enjoyed in an indoor play center. With various commercial play equipment, they can always have something to do. For example, bouncing, jumping, throwing or catching balls, or even just running. What’ more, parents do not have to worry about their safety, because of the high-quality and custom design of soft play equipment. They could just let their child run and jump as happily and freely as possible. Actually, the superb and safe soft play equipment will make it possible for children to foster a good sense of balance, as well as their agility. Taking part in those active activities can help them coordinate their hands and feet, also, help strengthen the connection between their brain and other body parts. Even more, such a soft play arena allows children to take some risks without any fear of getting injuries. Actually, the soft play equipment can not only create a controlled play space fora child but also can create a wonderful setting for role plays. Children can use the soft play equipment in may imaginative and mental games that will stimulate their brain function. Above all, the main point that the soft playhouse has on children refers to its safety. Normally, children of all ages could reap their benefits from playing with balls. So, if you want to find a kind of activity good for all ages, you can take the ball pools into your consideration. Having a ball pool in your indoor playground, you can offer children, especially those in early developmental ages, an unforgettable experience. As for the material of those balls, soft plastic without any harm will guarantee children’s safety while playing. Also, if children fall on those balls, they won’t get hurt either. Sometimes, children may get annoyed and tend to throw the balls at their partners. In this case, the hardball will be dangerous. However, the balls of ball pits are made of soft plastic, which will make the collision much safer. After getting rid of this fear, children, no matter the grownups or the toddlers, can play with their friends with a peaceful mind. Of course, an adult’s supervision will help make a greater safe environment when there are multiple kids in the ball pools. But generally speaking, children are less likely to get injured in the ball pools. Though ball pools are considered very safe for children, parents still have their worries about the cleanliness. In fact, many factors can result in the cleanliness issues. For example, food residue will invite the bacterial to spawn on its surface. Also, the young child suddenly peeing on it will make it nasty. Most of the time, general dirt on the ball’s surface will pollute children’s hands, faces, and bodies. Normally, whether you have an outdoor or indoor ball pool, you always have to do the cleaning job. Because good cleanliness is critically important for children’s safety and health. Usually, your budget is linked with the final cleaning effects. For instance, the limited budget will decide the way you clean your ball pool, as well as the cleaning frequency. Even more, which kind of cleaning tools and products you will choose also depends on your budget. Generally, the balls in a ball pool have a colorful appearance. And that will create a therapy like an environment for children of all ages. When children play in the pool, the balls will message their whole bodies. Also, the soft play shape of the balls will bring kids a deep-pressure and relaxation. During the play, children will get a sensory stimulus of visual, auditory, and tactile. Because of these stimuli, children can develop their sensory motor skills. So, you can see, ball pools have special appearances, trusty safety, and multiple benefits for children. If you want to run an outdoor or indoor playground, you really should consider this kind of soft play. On the one hand, it can add some fun to your indoor playground. On the other hand, the cleaning process may be respectively convenient for clean workers. In many cases, when it comes to playing equipment, most of us will have different questions. For instance, which type of indoor play equipment is better for infants? Which kind of indoor play equipment suits the toddlers better? Or which one will be much suitable for older kids? In fact, there are many answers to these questions. And one of them refers to when you should choose and select the indoor play equipment. Checking the list of the equipment that matches children’s developmental stage, as well as the equipment suitable for children of ages, will help you solve these problems. Exactly, parents and experts all agree that playing in an outdoor or indoor playground has great essentiality for children’s development. Based on NPPS, choosing the appropriate equipment such as indoor play equipment will be important. With the proper indoor play equipment, we can create a certain playing space for children of different ages. If you are going to plan out a play area for children of such age range, you must leave a unique play room or place for them. For toddlers, they always need enough space to explore the world around them. Usually, they tend to crawl over the whole area until they feel tired. Sometimes, those older toddlers will need enough space to stand or walk, to see the surroundings. For children in this age group, choosing indoor playground equipment, as well as creating an indoor play area, must take effect based on spaces having crawl spaces and smaller steps. Because children in this group need a larger active area than those little ones, you should prepare various play spaces for them. First, you should have enough room for younger ones to crawl. Second, you should provide a ramp and ladder for them to do some challenges. Also, you still need some pieces attached to ramps, which enables challengers to grab steadily. Thirdly, tables are also required for them to put their drinks or food. Eventually, the water-based playground equipment, with what they can manipulate materials, can provide them a good experience of sensory. In fact, if your actual budget allows, you can still get extra equipment for this play area. For example, tricycle paths of various textures, san areas with its cover, small-scale slides (straight slides like), and flexible spring rockers. The more indoor play equipment you have for them, children in this age group will have more fun. Compared to children of groups above, the elementary kids can enjoy a wide variety of indoor play equipment. They have relatively strong skills and sizes for all of these activities. In this way, you will have plenty of choice of proper indoor playground spaces and indoor playground equipment. For example, climbers or angles attached with chains or ropes, pieces attached with climbing (indoor climbing walls and such). If you want to make some differences for your indoor playground, you can also choose bars and cooperative equipment like indoor slides, sliding poles, ball pools, and indoor swing sets. In some indoor play parks, they can even combine children’s emotional development with their indoor play equipment. Indeed, a unique thought injected in equipment can help children develop their emotional aspects. Because the specialized play equipment will allow the child, especially the younger ones, to practice their new ideas. Actually, children can develop their social skills, in case they invite another playmate to play together. Planning play sessions with kids of similar ages will make an early social interaction for children. While playing in an indoor playground with equipment above, children can not only develop strong social skills in the early stage but also have great fun in a safe place or environment. Though children of all ages can develop their social skills by playing with group members, children of school age will need social skills more. So, you should create the chance of social growth and cooperation for these children. Even more, children can develop their intellectual acknowledges, since indoor playground areas can help develop problem-solving skills. Also, children can get new acknowledges by exploring and manipulating play items. As we all seen, the material of an indoor playground may vary. The most common ones include wood, plastic, and soft foam. Some outdoor may use the steel as their major material since equipment made of this material will be more durable. In many cases, indoor playground arena, together with the equipment in it, tend to utilize the material of soft types or soft foam. Thus, the indoor playground seems much safer than the outdoor one. As a matter of fact, an indoor playground in plastic or soft kind will save parents’ worries about the safety of their little ones. Still, the indoor polyethylene playset is available for young kids to play in a safer environment. Sometimes, many outdoor or indoor playground prefers to using the wood as their major material like an indoor wooden playground with an indoor wooden swing. Though this might look more natural, the wooden facilities are often less durable. Even more, once the wooden equipment is used frequently, they tend to broke down faster and bring much higher maintenance. Indeed, choosing the proper indoor playground equipment for your indoor playground is important. However, you should also pay your attention to the material of your playground surface. A protective surface almost has the same importance on safety as high-quality equipment. Actually, surfaces around certain indoor play equipment, which usually cause more falls than others, are particularly critical to safety. For example, surface around the indoor swing, indoor monkey bars, indoor slides, and indoor seesaws. Falls are usually highly linked with these activities. To reduce the harms from falls, many indoor playgrounds like to use the wood, rubber for safer, more hygiene and more aesthetic points. Most of the indoor playground, as well as indoor playground equipment, are made of Engineered Wood Fiber (EWF). This kind of material can make the playground and the equipment more durable. Florida health department vestibular boards have revealed that swings made of wood, along with wooden curved rocker sides, enable children to move back and forth and side to side. Play equipment like swings can help children to cultivate and extend a sense of balance and space. While lying, standing, sitting on the board, children will have nee the sense of balance and sense to help them understand their position. Vestibular swings usually have different shapes and sizes for different play areas. For instance, they have fixed or portable, hammock, flexion T-bar, and inner tube catering to different playgrounds. Using the indoor swing can simulate children’s balance of torso from the aspects of circular, linear, or rotational plane. Children of different ages will all reap joys and merry memories from these various swings. The material of soft foam can be seen most in rocking boats. Actually, rocking boats made of wood, plastic, or foam will allow children to rock in a secured and sited position. Most of the time, two children are needed to play with the rocking boat at the same time to make it move. Rocking in a rocking boat will need a good balance of children. Children who have a good balance can stay in a secured position much easier than those haven’t. Meanwhile, kids with a poor sense of balance may fall down and get injured at sometimes. Generally, we regard the ball pools as soft play equipment and soft foam too. Indoor play equipment made of foam can be built into different shapes, sizes, and colors according to your budget. Usually, the balls in soft foam kind can guarantee a safe environment for kids. Though this kind of ball has a highly safe promise, parents should not abandon the supervision of their child. This is because, except for spinning balls in their hands, the child may throw balls at their partners or anyone nearby. And that impact may lead to hurt sometimes. Soft foam playing usually has a familiar appearance of objects such as vehicles, plants, or animals. These adorable shapes usually have a shiny PVC outer, which empowers the surface to be water and urine resistant. Also, these various colored soft plays offered young children many proper options. Since the soft foam playing has the PVC covers, you have to make sure every participator of activities linked with soft foam playing have already taken off their shoes and socks. With this premise, you will have an easy time during the cleaning process, also, the PVC covers can have a lasting working time. Whether you want to make parts for the large soft playground or position rolls and wedges, you always need the foams to help you. As one of the most entertaining indoor playground equipment, the rocking horses are usually made of plastic. Equipment in plastic kinds tends to work much longer time than one in other kinds. While riding rocking horses, children need to push their legs tightly together and adjust their bodies to a suitable position. During this process, children will empower their head control, posture, and sitting balance. Except for their common durability, soft foam and plastic have the same characteristic of being easily washed and reused. Due to this characteristic, equipment made of soft foam or plastics will help you save your spending on purchasing and cleaning. This part mainly refers to mattresses, which usually made of foam and waterproof material. Also, these mattresses should be inflatable. Sometimes, the inner space of this kind of mattress can be filled with water to provide a different tactile. Normally, we can adjust the inflatable mattresses based on different types of air pressure. And the half-inflated mattresses have more supportive and suitable functions for children with proper movements. In fact, mattresses can also have other benefits for kids, regardless of their supportive and suitable effects. For instance, as children tap on the mattresses, they can encourage themselves to move and develop their listening by transmitting sound by air. Actually, we would like to take a solid rubber surface as the first and best option for an indoor playground. Because it can not only guarantee children’s safety but also it requires a minimum of maintenance among other options. Usually, two main types of solid rubber surface are available for the indoor playground. The “pour-in-place” is the most famous one. After pouring the rubber over the base and smoothing, then, you can paint on any color you wish. Another solid rubber surface usually uses rubber tiles to fit together to make a solid surface. In fact, there are still other advantages make itself a great option for our indoor playground. The characteristics of slip resistant and is accessible by wheelchair and stroller are all the plus. However, as the old saying goes “everything has double sides”. So, the same goes for this solid rubber surface. Though it has so many advantages for you, it also ranges one of the most expensive options for covering the walls or floors. This kind of surface cost you less than solid rubber surface. Hence, you can take it as an alternative option. Compared to solid rubber surface, artificial grass or turf also has low maintenance, as well as can be accessible by strollers and wheelchairs. When it come to cleansing, a water rains-off will help handle this. Still, the water can drain up without any measures. Besides, the new technologies involved in the manufacturing process of this artificial grass empowers this protective surface a more realistic shape. Even more, this kind of surface have better textures and higher quality due to the new technologies. Since this commercial option have an affordable price for most indoor playgrounds, it became very popular among indoor playground covers. However, for children with a special need or ADA using, this commercial surface has a poor capability. If you decide to cover your ground surface with this play sand and pea gravel, you should make sure you get enough depth. In general speaking, to prevent severe injuries form falls, twelve-inch depth is the bottom level of the depth. While choosing the sand types, you should mind whether it contains the harmful chemicals and materials or not. Purchasing specialized playground sand will help avoid such hazards. The rubber mulch has a lower price than solid rubber surfaces, while can cushion the landing of children. Based on the advice of experts, this kind of protective surface is not recommended for children because it can be recycled. If you have used Engineered wood fiber aka EWF in your place, you may find out that you have made an economic option for yourself. Actually, being the playground cover this kind of playground covers have a long-lasting effect. The Engineered Wood Fiber is made from virginal wood without any sawdust. Because of its superb capability, this kind of landscape mulch is better than ordinary ones. Applying this playground covers to your indoor playground can make the play area more natural and safer. Also, it has a strong ability to keep children safe. Actually, the price of the commercial indoor play equipment may vary due to your choice. Many factors can become part of your final costs. For example, how many equipment you want to buy? How large your equipment be? What is the size of your play area? You should count all of these as part of your budget. In general speaking, for one single square meter per a two-level structure, it will cost you $90-$110. This is an average budget for a normal indoor playground. If you want to add another more structure level, you have to increase your budget at the same time. For instance, the average cost per square meter of a tree level structure will come between $180 and $230. Sometimes, per square meter of a multi-level structures in the indoor playground arena will cost $400. In fact, making a detailed plan will help you to master your final cost. Every equipment has its own price, and the price will vary depending on what you will choose. Sometimes, if you can purchase the equipment in a sale, you can save a large amount of cost. For instance, you can get your hand on a pretty cheap indoor seesaw, cheap indoor swing set, and cheap slides. Every single saved cost will definitely reduce the final cost of your indoor playground. Before buying indoor playground equipment, you should make a thoughtful plan first. Also, you can compare the prices quoted by multiple indoor playground equipment manufacturers, then, decide which one to choose. Usually, you may have to introduce the soft play equipment to your indoor playground. Because soft play equipment is considered as a pretty important part of commercial indoor playground equipment. As for the cost of soft play equipment, it also varies. For instance, toddler baby blocks will cost your about $70-$80 and you may have to pay $10 or $20 more for big blocks. If you decide to employ a matching mat, your cost will go up to $200. Also, buying a jumbo soft block will need $500-$1000. After paying off for the equipment, the nest step you have to do is to do the installation. You will need an engineer to help you install Kids indoor gym equipment and non-soft equipment, as well as commercial soft play equipment. In this case, the average cost of a working day will be $100. Beside the salary, the buyer has to pay the round tickets, accommodation, and any other related expenses for those engineers. Normally, you can see the complete installation cost, if your buy the indoor playground equipment from mass indoor playground equipment suppliers. You always need a professional to help install the equipment unless you get a local retailer as your supplier. Buying equipment from a local retailer will help reduce your cost, since no extra expenses exist. Basically, the total cost of installation takes up approximately 15 percent of the budget. If you can take upon installation all on your own, you can save up all the costs above. However, you may have an easy time in case you turn over all your installation job to the manufacturer. Parents should notice that some equipment is not recommended for kids under 5. Below are 7 examples. Besides, we also give 4 safety tips for ensuring children’s safety. Make sure the child has already taken off their shoes and socks, before playing soft play equipment. This precaution will not only help prevent injuries but also can prevent damages to the equipment. The parents or guardians should know the child’s limits and give up the comparison. In fact, a child has almost the same abilities compared to those in his or her age. Remember to do a safety check before using the equipment, notice the warnings or recommendations. In this way, parents can create a safe play environment for their kids. While playing in a public indoor playground, parents should tell their kids to beware of strangers. Once you have decided to install all the equipment by yourself, you should get complete and total instructions to help you. Be it in big scale for public usage or a small one inside the house, you should read the instructions thoroughly, then, start the installation. As the old saying goes “sharpening the knife is the first”. So, you should equip yourself with a well understanding of the instructions. In this way, you will have no difficulty in the ensemble of the parts and equipment. Ask the installers of the company to install the indoor playground equipment, and you will save much time. Though you have to pay the extra expenses by yourself, you can make sure the installation is right. Also, supposing some problems occurred, you can ask the company to fix it quickly. After you install the indoor playground equipment, soon your indoor playground will be put on wheels. As time goes by, your equipment will wear down quickly unless it had good management. Continuous management will keep your equipment in a high-quality position. Do not worry about the methods, we have already got some methodical procedure for you. The following procedures will teach you how to maintain an indoor playground arena, as well as how to maintain indoor playground equipment. Cover your inspection over the whole site like seats, fences, pathways, and any other parts. If you just limit your inspections to the playground equipment, you cannot guarantee that your entire indoor playground is safe. In case you want to maintain the indoor playground equipment on your own, you should take complete training courses. Through such courses, you can learn the detailed steps to examine and maintain your indoor playground area and your equipment. Having a good understanding of the detailed procedures will help you save lots of your time, as well as plenty of money. If you want to let the manufacturing company do the job of maintaining, you have to pay the maintenance expenses. The cost of maintaining your indoor playground area and indoor playground equipment may vary based on the frequency. For example, the maintenance expenses of the monthly, trimester, or annual will have a great difference. 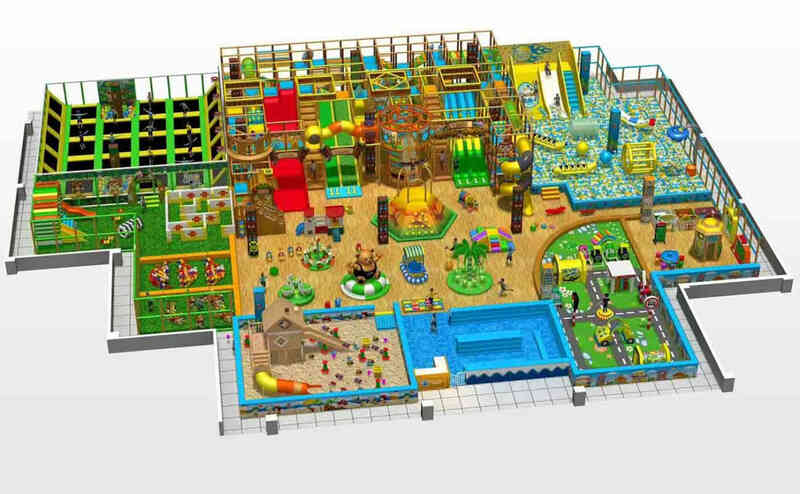 Once you have decided to buy some kids indoor playground, you can buy it online and offline. Order them online is considered as one of the best ways to buy equipment. Actually, you can always find many indoor playground suppliers who can provide equipment in various shapes and sizes. Nowadays, there are many indoor playground equipment manufacturers residing in China. And they produce various kind of commercial indoor playground equipment. For example, Wonka Playground is an experienced commercial indoor playground equipment supplier in China. They have high-quality products, which can be customized based on your budget and the size of your place. If you want to buy some soft play for your indoor play area, you can always find some soft play manufacturers or soft play suppliers online. They have detailed information, which can help know more about their products. As for the small-scale soft play, you can go to a local retail shop to buy some. While doing shopping online for online sales, remember to check the material of the soft play equipment. This checking procedure will help prevent safety problems linked with the equipment textures. This entry was posted in blog and tagged indoor playground business, indoor playground equipment.